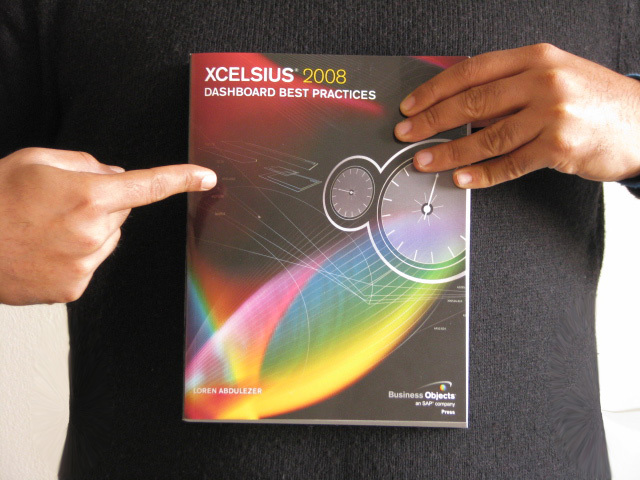 Book Alert: Xcelsius 2008 Dashboard Best Practices – I’ve Got mine! The Wait is Over! Finally the book has arrived in the stores. The much awaited “Xcelsius 2008 Dashboard Best Practices” book is now available on Amazon. Go grab it now. I’ve been working with Xcelsius since 3 years now and I have not seen a book on Xcelsius which is as detailed as this one. Although I learned a lot from Mike Alexander’s Dummies book Crystal Xcelsius For Dummies (For Dummies (Computer/Tech)), this one is different. Learning Xcelsius is different from effectively using Xcelsius. This book will help you understand and implement Xcelsius for your Dashboard Solutions. The humongous list of best practices that Loren put together in this book is very impressive. I thought it would be a skinny book with few best practices, however when I received the shipment, I was amazed to see that it was a pretty fat book (400+ pages). I was so Curious to know how he came up with so many best practices. When started reading about it, I was amazed to know that there were actually a lot of best practices that I didn’t knew. Almost 70% of them were new to me. From Fundamentals to Advanced features, Loren touched every aspect of Xcelsius Dashboard Design. Although there was a Chapter (Chapter 15) dedicated to Data Connectivity to create Live Dashboards, I would have been thoroughly satisfied if it had more information on other types of data connections available in Xcelsius 2008. Nevertheless, this book is a great compilation of Xcelsius Best Practices. A must have for any Xcelsius Developer (Novice or Pro). I have purchased and received this book. I was hoping that there would be access to some of the examples in the book. I am surprised and disappointed that an electronic supplement is not available. I have found the book to bee quite well written and have ordered 3 more for others in my group. Is there a reference to this material that I am not seeing? If so I would appreciate someone pointing it out. Thanks so much for taking interest in my book! I hope you realize that if Kalyan shared the coupon code on a blog that gets read by the whole community, he could get into serious trouble with the book publisher (and I don’t think you want to be bringing that upon him). Let me give you some hints so you can view pages that are publicly accessible on the Internet. As of the time of this post, http://www.informit.com/safarifree allows you to enroll in a free trial that lasts for 10 days or the first 100 pages views, whichever come first. If you already have a Barnes & Noble account, more preview pages are visible (actually, a lot more pages than Amazon displays within their “Look Inside” feature). Hopefully, there is enough material within these sources to make a determine if it warrants your $30 investment for the book. My guess is that if you or anyone else are serious about using Xcelsius or similar dashboard tools in your line of work, it benefits you to have at least a few standard references in your arsenal. If you really want to save money and have an iPad, PC, or Mac, the Kindle ebook of Xcelsius 2008 Dashboard Best Practices is a pleasure to read and it only costs $17.59. Unlike the printed edition of the book (which only has color plates), all the illustrations in the ebook are in color, the text is searchable, passages in the text can be highlighted, and you can insert your own annotations and bookmarks. One more thing… unlike the majority of Kindle books, all the entries in the book Index contain links directly to the related book content. I hope this information proves useful. Best of luck in your work with Xcelsius dashboards!